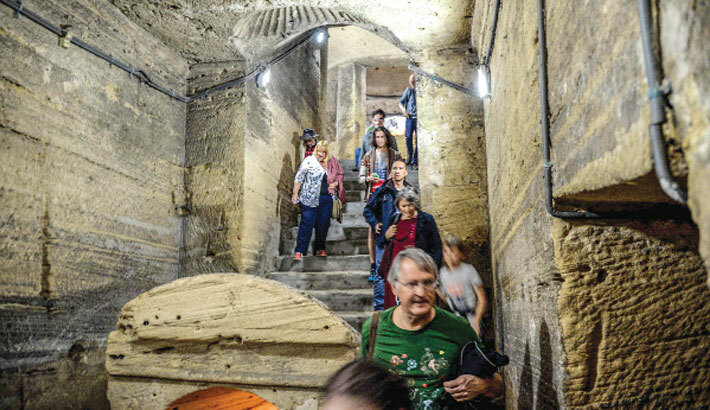 Alexandria: Egypt on Sunday completed a project to restore the 2,000-year-old catacombs of Kom el-Shoqafa in western Alexandria, which have been prone to groundwater leaks since they were discovered in the first decade of the 20th century, reports Middle East Eye. The Kom al-Shoqafa location, considered by archaeologists to be the largest Greco-Roman burial site in Egypt, has been threatened by water since its discovery in 1900, AFP reported. The catacombs are unique, mixing ancient Egyptian and Greco-Roman architectural styles. They were carved into the rock on three levels. The ground level was damaged by water from nearby farmland and a canal. The rising water prompted Egypt to launch a massive drainage project supported by the United States Agency for International Development (USAID) in 2017. The $5.7m grant also covered maintenance and training for ministry employees, Reuters said. Antiquities Minister Khaled al-Anani told reporters at the site that the programme had helped “end a problem threatening the area for more than 100 years”. “The antiquity underwent many restoration projects, the most important of which was in the mid-90s, which was an ambitious project supervised by the Supreme Council of Antiquities,” Anani said.